After receiving little success from the previous year’s appeal letter, San Antonio Christian Dental Clinic was ready to try a new approach to their end of year appeal. The clinic was opening a call for year-end donations, dental supplies, and volunteer assistance from past and prospective donors. Ultimately, SACD wanted to spread the word of their organization, while also cutting down on large blocks of copy traditionally seen in appeal letters. The San Antonio Christian Dental appeal letter was re-imagined as a personalized folded piece, with each recipient’s name, pulled from data on file, printed on the front. Once opened, the appeal placed the spotlight on the story of Gabriel, a patient whose life was changed thanks to a procedure completed at SA Christian Dental Clinic. The copy of Gabriel’s account was presented as its own stand-alone story, taking a step away from the traditional appeal letter format. 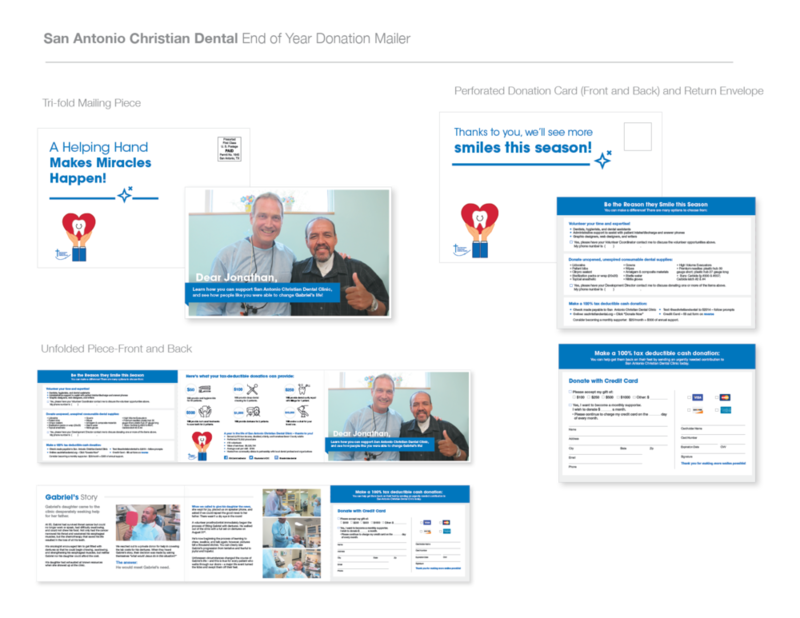 A perforated tear-out donation/volunteer card and return envelope accompanied the story. Additional panels on the appeal piece contained a record of SACD’s past yearly performance and included iconography of what the donations to the organization would help fund. To further the personalized aspect of the piece, the messages of the appeals were slightly altered based on data provided by the San Antonio Christian Dental database. The appeals of previous donors incorporated messages thanking past contributions, while new prospective donors were invited to learn how they can make a difference with their first-time donations to the clinic.